Standard straight port for standard 25 mm port. O-Ring distance from the flange is 0.43″ (11 mm). 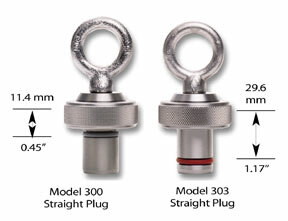 While the Model 300 has the same body dimensions as the Model 303, the o-ring on the Model 300 is closer to the inside flange. The length is 11.4 mm from the inside flange to the top of the o-ring groove.